Encore Boston Harbor is living up to the hype. District Council 35 contractors are currently employing upwards of 125 members between paint, drywall, and signage. This number does not include wall coverers and glaziers, which will add another 80 members to the total. I am happy to report that our contractors are exceeding the female and minority hiring levels requested by the owner. SOEP hired our first apprentice in coordination with our partnership with Madison Park Technical High School. Great job, brothers and sisters! 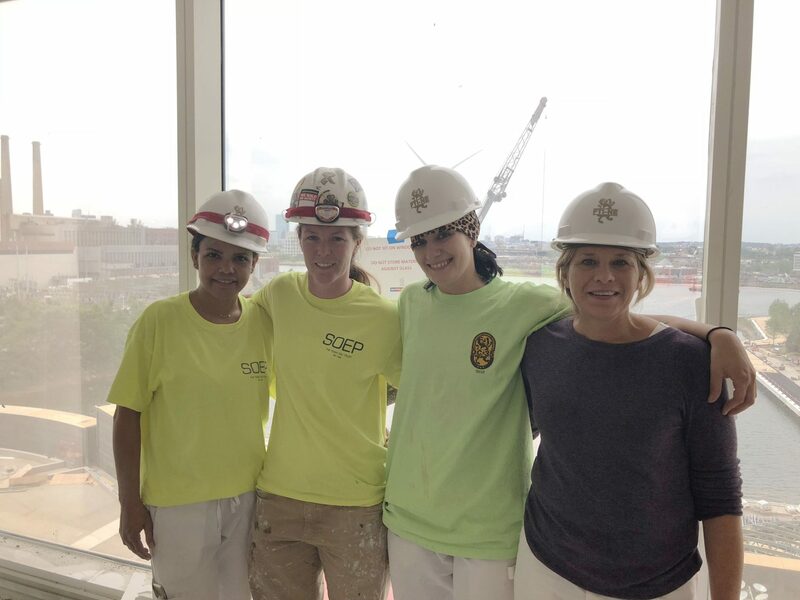 Journeywoman Michelle Hennessy along with new apprentices Tamara DeAraujo, Nicole Fuller and Gretchen McGowan working for Soep Painting at Encore Boston Harbor. Our Lowell office is now open and I’m excited about the opportunities this location brings us. 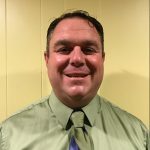 For the last few years, Business Representative Ray Pickup and I have worked to build relationships in Lowell, and this office proves our commitment to the community. Thus far we have used our new location to meet with members of the City Council, the City Manager, Housing Authority leaders, state representatives, non-profit organizations, as well as candidates seeking endorsement. Our meeting with UTEC, a non-profit organization in Lowell that works with troubled and at-risk teens, led to a promising partnership that is already making a difference. Our first UTEC graduate has started work at the Lowell Housing Authority as a member of DC35. 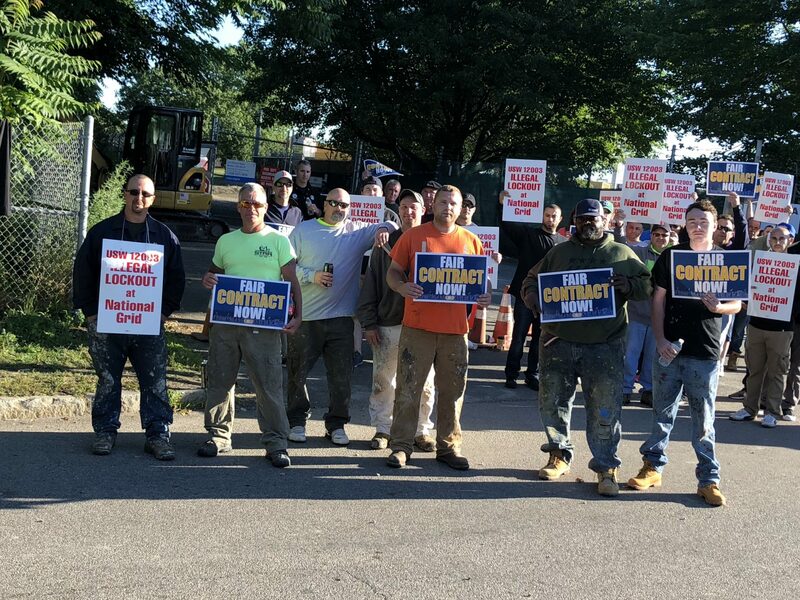 DC35 members working for John W. Egan do not cross the line, we walk the line with our brothers and sisters from Steelworkers local 12003 who’ve been locked out by National Grid. Brothers Bobby Johnson, Charlie Templeton, Brian St. Jean, Tony Sokolowski, Chad Pinkham, John Woodbury, and Joseph Giles. As part of the International Union’s Drug Task Force Committee, I met with the LMCI earlier this month to continue our work developing a national fast track help system for our members struggling with addiction and mental health disorders. Our team, comprised of members and contractors from all over the country, worked diligently for two days at the Park Plaza in Boston mapping out new strategies and cleaning up some old ones to bring this program together. I’m happy to report DC35 is already implementing the recommendations and trying out new things to help our members. I am very proud of this committee and look forward to sharing my knowledge and experience with the International and learning new things that will benefit our members here at home. Amy Delaney of the City of Boston Health Commission speaks to the staff at DC35 while giving a Narcan training. 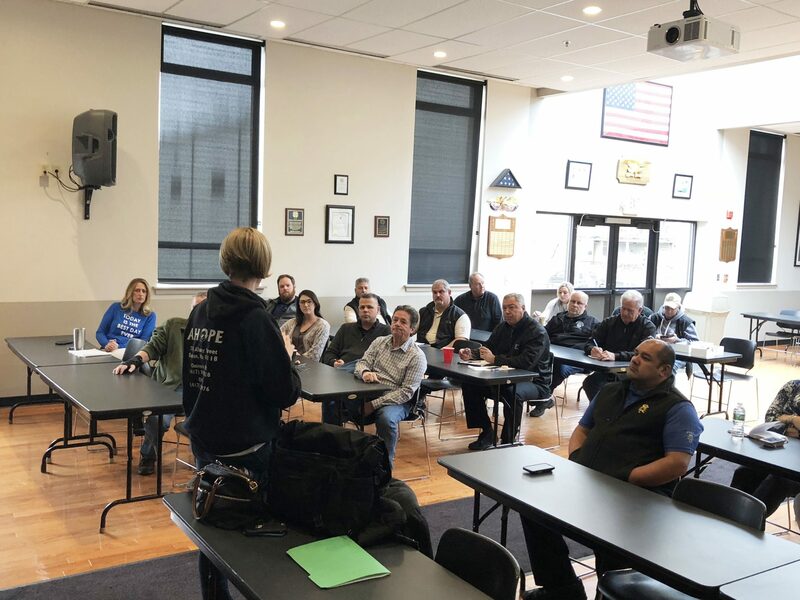 BM Jeff Sullivan ordered all employees of the council to take this training as part of DC35’s continued commitment to combatting the opioid epidemic. Don’t forget, the recovery group meets every Wednesday at 7p.m. at the Union Hall. You don’t have to do it alone. 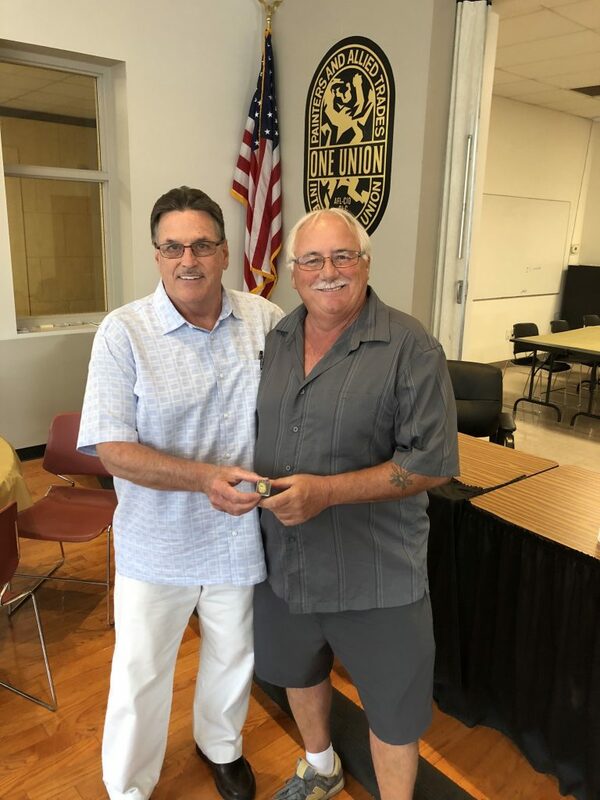 BM Jeff Sullivan gives retired brother Kevin Kelly Sr. of Local 577 his 35 year pin at the retirees annual clambake. Wishing Kevin a healthy retirement! 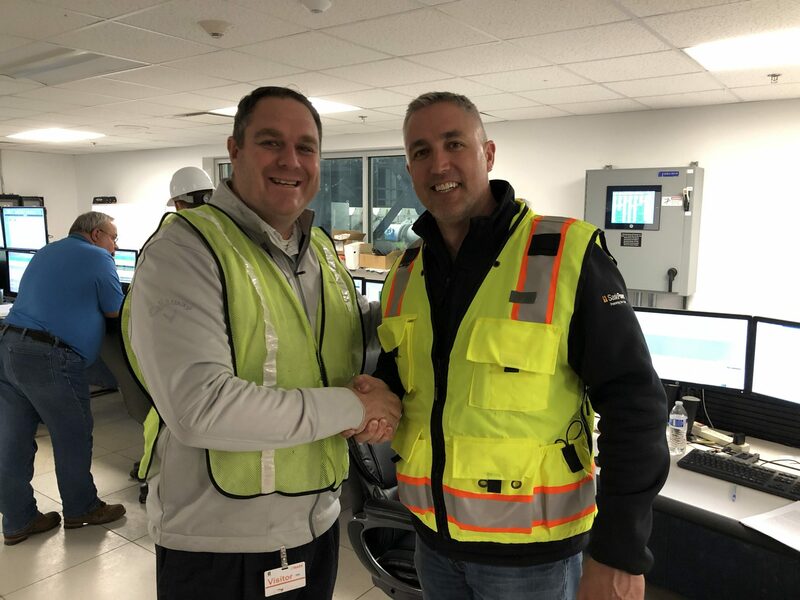 Chris Brennan with Burns & McDonnell Senior Engineer Chad Kirby after finalizing the PLA at the Salem Power Plant on behalf of the North Shore Building Trades.